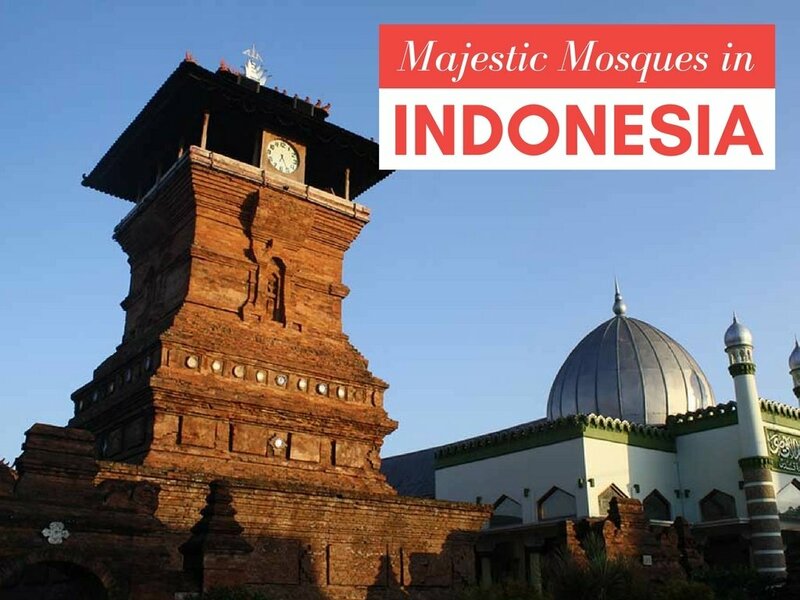 Indonesia is the most populous Muslim-majority country in the world, and it is therefore no surprise that it is home to some incredible, world-renowned mosques. Visited by worshippers, as well as tourists from across the world, these mosques are known for their exquisite architecture, intricate design, and size. If you’re planning on visiting Indonesia and not sure which mosques deserve a visit, here’s our guide to 5 of Indonesia’s most majestic mosques! . The national mosque of Indonesia, and the largest mosque in the country, as well as Southeast Asia. Istiqlal Mosque was built to serve as a memorial to Indonesian independence, and a visit to Jakarta is therefore incomplete without a visit to this mosque. Located in Jakarta, it stands across the street from the Jakarta Cathedral, and next to Merdeka Square. The mosque is spread across nine hectares, can accommodate over 120,000 worshippers, has 7 gates, 5 floors, and is home to a massive rectangular prayer hall, above which is a large dome supported by twelve columns. The interior of Masjid Istiqlal is quite simplistic, with graceful Arab calligraphy. Surrounding the mosque is a gigantic courtyard, which can also accommodate thousands of worshippers. . Formerly known as the Grand Mosque of Bandung, Masjid Raya Bandung, in West Java, Bandung is one of the city’s iconic buildings. A landmark of Bandung, Masjid Raya Bandung was built in 1812 and has undergone several renovations since. Initially a simple building, with Sudanese architectural influences, today’s Masjid Raya Bandung is anything but simple, even though architecture from the old mosque can still be seen. The large building now consists of several floors, is topped off with domes and is accompanied by two towers. While the mosque is frequented by worshippers from all over the world, it is also visited by non-Muslim tourists, and is a gathering spot for locals. Visitors can climb to the 19th floor of the towers, which is the top floor, to enjoy a 360 degree view of Bandung city. .
Also located in Bandung, West Java, is Al-Irsyad Mosque. This mosque, unlike almost every other mosque in the world, does not have a dome; which is usually a typical characteristic of a masjid. The modern looking Al-Irsyad Mosque is cube in shape and is unique and innovative in style and architecture, with a stunning exterior and an equally beautiful interior. Al-Irsyad Mosque is however not as large as the above mentioned mosques, and can only accommodate approximately 1,000 people. . Located in Kudus in the Indonesian province of Central Java, the Menara Kudus Mosque is another of Indonesia’s most majestic mosques. Known to be one of the oldest mosques in Indonesia, dating back to 1549, Menara Kudus Mosque is also renowned for its stunning, unique design. It is a combination of Islamic and Hindu architectural styles, due to Hinduism being the predominant religion at the time the mosque was built. The mosque is temple in shape with a Hindu-Java-like exterior decorated with ceramic plates. Menara Kudus Mosque is thus a true example of the tolerance and harmony shared between the Muslims and the Hindus in the area. . Located in the Aceh Province, in the heart of Banda Aceh City, is the Baiturrahman Grand Mosque, an icon and landmark of Banda Aceh. Over a 130 years old, this Grand Mosque is a great example of Islamic architecture with its majestic domes, minarets and white exterior. It is also quite renowned, as it survived the 2004 earthquake and tsunami which destroyed most of the city. The mosque is also where people of the city sought temporary shelter during the natural disaster. A trip to Banda Aceh City is truly incomplete without a visit to the mosque.